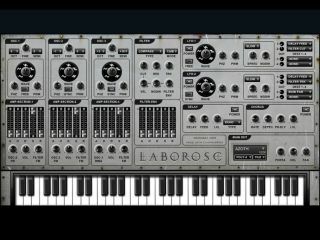 LaborOsc: another free Windows synth for your rack. From this Wednesday to Saturday, the attention of the world's music makers will be focused on the Frankfurt Musikmesse, where many of the big commercial developers will show off their latest wares. However, if the prospect of seeing a load of new products that you can't afford leaves you downhearted, we have a little pick-me-up: four new (or updated) music-making tools that won't cost you a bean. This week, we have an updated stereo enhancer, the obligatory new synth, a tweaked audio/MIDI sequencer and improvements for an entire range of effects. A beta of version 2.0 of this freeware stereo enhancer is now available. A single slider enables you to adjust the stereo width (from mono to wide), while Air and Bass boosters promise to let the audio 'breath'. Click the Loud button, meanwhile, and you'll activate a saturator that will give your mix a boost. Yep, it's another freeware synth. This one has three oscillators that can pick from five waveforms, a LP/HP/BP/RB filter, an AHDSR filter envelope, two LFOs and a couple of effects. There are eight voices of polyphony to play with and 20 presets, though you'll find slots for up to 200. A small v5.12 update gives us the opportunity to point you in the direction of the free version of this Windows audio/MIDI recording app. On the downside, it only enables you to use three tracks, but this should be enough if you simply need a songwriting scratchpad, and you can always upgrade to the Pro ($69) or Pro Plus ($119) version if you dig the workflow. An across-the-board update for Melda's range of free effects - the GUIs have been improved, and there are specific fixes for individual plug-ins. While you're at the company website, we strongly advise you to check out MDrummer Small, too, a rather impressive free drum tool.